A day after lawlessness was reported in the Punjab Vidhan Sabha, the police has registered a case against 15 MLAs under various sections of rioting, assault on public servant and extortion. The Punjab Congress, which has been cornered in the ongoing Budget Session with the suspension of nine of its members for indulging in disruptive activities, wants to stage a comeback in the assembly with all its MLAs but "with dignity". The ruling SAD-BJP alliance today played the Dalit card as a perfect antidote to the one used by the Congress in showcasing the alleged caste bias by the Treasury Bench in the Vidhan Sabha yesterday. The court of Judicial Magistrate, Faridkot, today issued arrest warrants against four family members of the newly elected Moga MLA Joginder Pal Jain. The prevailing uncertain weather is not good for most of the Rabi crops. "A fluctuation in the temperature at this stage may harm the crops, especially wheat," said Dr SS Gosal, Director Research, PAU, Ludhiana. The temperature rose to 30 degree Celsius in this region last week. The same fell sharply during the last 48 hours. The sudden rise or fall in the temperature is not considered good for wheat crop. Former Chief Minister Capt Amarinder Singh today met Congress president Sonia Gandhi in New Delhi, the first meeting between the two after the former handed over reins of the party’s Punjab unit to Partap Singh Bajwa. Bathinda MP Harsimrat Kaur has demanded that loans taken during the President's Rule in the state for fighting militancy should be waived to help the state revive its economy. The Punjab Vidhan Sabha today recommended that the state government should initiate socially motivating programmes against wasteful expenditure on marriages while adopting a proposal mooted by Malout MLA Harpreet Singh. Former Chief Minister Capt Amarinder Singh today said it was not appropriate of Chief Minister Parkash Singh Badal to talk of Parliamentary values when "he had himself pounced on former Speaker Surjit Singh Minhas and toppled the latter's turban". The Punjab State Commission for Scheduled Castes today issued notice to the UT Home Secretary, Senior Superintendent of Police, UT, and Secretary, Punjab Vidhan Sabha, seeking a report on the action taken on the assault by Congress MLAs on Head Constable Jai Pal. The Kisan Sangharsh Committee, Punjab faction, led by Satnam Singh Pannu, and 12 other farmer and labour organisations are gearing up to stage a dharna in all the district headquarters on March 18 over the arrest of farmer leaders in the ASI death case and various issues facing the farming community. However, differences among various farmer outfits have to the fore ahead of the protest. 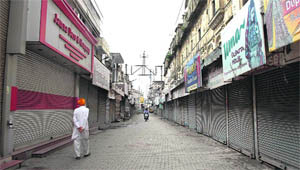 Expressing solidarity with the Vyapar Bachao Sangharsh Committee, shopkeepers and traders throughout the city voluntarily closed their shutters in protest against the imposition of property tax on all residential and commercial establishments. The Panjab University (PU) syndicate would decide whether or not 10 students of Guru Nanak College for Girls, Ludhiana, should be allowed to appear in the final year exams this year in a meeting on March 16. The students had failed to clear their compartment in their first year undergraduate courses even after two attempts. The college broke the rules and provisionally admitted the students into the final year. Seven students enrolled in BCA and one each in BA, BCom and BBA degree courses had failed in one of their subjects in the first year. The students were given admission in the second year during which they appeared for the two compartment chances as per the rules. The Punjab and Haryana High Court has set a two-month deadline for the State of Punjab and its functionaries to redress the grievance of 1984 riot victims for handing over the possession of LIG flats. The Fatehgarh Sahib police has arrested a man from Ludhiana, in connection with the seizure 26 kg of heroin from Zirakpur a few days ago. The local police has booked five persons for allegedly assaulting SGPC employees and robbing them of Rs 1.5 lakh here last night. The accused have been identified as Balbir Singh, Harjinder, Gurmail, Harinder and Chhotu, all residents of Ghanauli village. The injured Gurminder Singh, an SGPC truck driver, in his complaint stated, he along with cleaner Harpal and store keeper Kuldip were attacked and robbed at Ghanauli village. The Congress MLAs who have been named in the FIR are Balbir Singh Sidhu, Gurkirat Singh Kotli, Jagmohan Singh Kang, Kuljeet Nagra, Sukhjinder Singh Randhawa, Rana Gurjeet Singh and others. The complaint was lodged by head constable Jaipal of the Punjab Police, which was forwarded by Punjab Armed Police commandant Sukhwant Singh Gill and ward officer Jasjeet Singh to the Sector 3 police station. The complaint states that the head constable was severely assaulted by the Congress MLAs around 10.30 am yesterday. Jaipal was on duty as a watch and ward staff when the incident occurred. It started when the Leader of Opposition Sunil Jakhar got up in the middle of the session and said the Congress Legislature Party (CLP) office had been allegedly raided illegally by the police. In the absence of any definite answer from the Speaker, all Congressmen left the House and went to the CLP office. The MLAs allegedly broke the human wall of watch and ward staff, beat up marshals and head constable Jaipal was manhandled on the spot. "After a confrontation with the commandant, a group of 15 to 20 MLAs attacked the head constable. He was grabbed from his hair and pushed to the floor and the legislators also robbed him of his identity card," states the complaint. Police conducted the medical examination of the head constable at the Government Multi-Specialty Hospital in Sector 16, which established that he had received bruises. Police said they have added the section of extortion as the head constable was robbed of his identity card. Later in the day, eight Congress MLAs reached the Chandigarh police headquarters in Sector 9 and met Inspector General of Police RP Upadhyaya and gave a written complaint against the Punjab Deputy Chief Minister and the Speaker for trying to obstruct the Congress MLAs from participating in the debate on the Governor's Address and for using police force against the elected MLAs and getting the officer of CLP raided. Upadhyaya said, "We will look into the complaint and conduct an inquiry." The party cannot go to the assembly when nine of its legislators have been suspended for the duration of the session. But at the same time, it cannot even afford to boycott the assembly as that would mean failure in its duty to corner the SAD-BJP alliance on vital public interest issues. In such a situation, the party seems to be exploring its options to bring about a rapprochement. Congress Legislature Party (CLP) leader Sunil Jakhar when questioned on the issue said he was in favour of participation in the session, but that the "dignity of the legislators should be maintained". The SAD-BJP alliance is clear that in case the Congress wants the suspension of its legislators to be revoked, they must apologise for their actions. This includes disrupting the House proceedings and even taking over the chair of the Speaker. The alliance also wants Jakhar to apologise for his actions, including bringing the Tarn Taran police into the house "unauthorisedly". Jakhar said he had called a legislature party meeting late in the evening (at legislator Gurkirat Kotli's house), which would deliberate the issue. The party has also issued a whip asking all its legislators to be present at the CLP office tomorrow. The CLP leader also made a half apology on the issue, saying there was no virtue to be found in what happened yesterday. He said the unruly behaviour was unfortunate but qualified it by saying that "it was the result of extreme provocation". He said the Congress also needed an answer from the Treasury Benches for sending the police to the office of the CLP leader. Sources said what finally went against the Congress and resulted in the lengthy expulsions is the disillusionment of Chief Minister Parkash Singh Badal with the CLP leader. They said Badal was upset because he went out of the way to ensure smooth functioning of the Budget Session. This included removing bad blood between Revenue Minister Bikram Majithia and Congress MLA Rana Gurjit in the last session through a special meeting before the start of the Budget Session. However, sources said the CM felt the CLP leader had tried to create a media sensation by bringing in the assault victim into the House in an unauthorised manner. They said it was because of this development that the CM did not apply his "soothing balm" in the current case. After yesterday's beating up of a watch and ward staff by Congressmen, the ruling SAD members today flexed their vocal chords, and even muscles, telling the opposition to "keep within their limits"
Dera Bassi MLA NK Sharma said: "Mr Speaker, ask these goons to behave otherwise things can go very far. If things are not controlled, we might end up fighting actually"
The alliance claimed that the watch and ward staff member, Jaipal, who was beaten up by Congress legislators yesterday, was allegedly asked about his caste while he was thrashed. The Congress had yesterday alleged that the Tarn Taran police brutality victim, a 'Dalit', was not being extended helped by the state government. After Speaker Charanjit Singh Atwal announced the suspension of nine Congress MLAs involved in Jaipal's thrashing, the ruling combine leaders had their guns trained on the Opposition members on the Dalit issue. The House was informed that Jaipal was the single earning member of a Scheduled Caste family and that yesterday's incident had left an "indelible impression on his mind". He was thrashed mercilessly while being asked about his family background, it was alleged. The Speaker was also asked that an FIR be lodged against all the accused. "It is shameful that a watch and ward staff member, whose job is to look after the security of others, could not save himself from hooligans who abused him after enquiring about his family identity," a ruling party member said. SAD MLA Mohinder Kaur Josh pointed out, "Chief Minister Prakash Singh Badal has been very clear in providing adequate representation to the Dalits. We have 24 Dalit legislators, something that has never happened in any state government earlier." In the absence of Congress legislators, who kept away from the Punjab assembly after nine of them were suspended, Revenue Minister Bikram Majithia took on the role of the opposition by forcing the Speaker to commit that he would personally monitor the case involving an attack on jaipal. Though a case has already been registered against a number of Congress legislators, Majithia wanted the Speaker also to act on the issue. The demand from the Revenue Minister became even shriller when the Speaker indicated it was for the police alone to act in the matter. Majithia reminded him that he was the custodian of the House and that the members looked up to him and not the police to protect the honour and dignity of the "Dalit brother" who had been manhandled by the Congress legislators. Asked about attempts by MLAs at wooing the Dalit population, Minister for Parliamentary Affairs Madan Mohan Mittal said these were the personal views of the legislators. "It is not the government's stand," he said. Congress Legislature Party Leader Sunil Jakhar said, "Playing Dalit card in the House was a premeditated plan by the SAD." Cancelling the bail bonds of Jain's wife Swaran Lata, sons Akshit Jain and Punit Jain and daughter Rohini Jain, the court directed the police to arrest them and produce them before the court on March 22. Jain and his family members are facing a criminal case for allegedly violating the Punjab Apartment and Property Regulation Act by raising an unauthorised residential colony in Moga. The case was registered on August 26, 2007, at the Mehna police station in the district. In the past five years, the court has many times reprimanded Jain's family members for their non-appearance in the court. On February 4, the court had cancelled the bail of Puneet Jain and issued non-bailable warrants as he had not appeared before the court despite reminders. On March 4, Puneet filed an application in the Sessions Court for an anticipatory bail. During the hearing of the case today, the counsel for the MLA and his family members moved an application seeking exemption for them from personal appearance in the court. While the court allowed the exemption to the MLA due to the ongoing Punjab Vidhan Sabha session, it declined to oblige his family members. The court issued their arrest warrants since they had not been appearing before the court for the last four hearings. The court had earlier declared Puneet an absconder in July 2010. In April 2010, the court had issued his arrest warrants. But the police could not execute the warrants on the plea that Puneet was in Canada. "A steady rise in the temperature in March benefits the wheat crop that starts maturing in the second fortnight of the month. 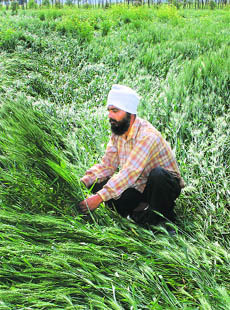 A steady weather ensures proper formation and development of grains at this stage," said Dr Gosal. Reports of rain, accompanied by fast blowing winds and squall have come from Jalandhar, Ludhiana, Ropar, Patiala, Amritsar, Mansa and Bathinda. Though it has stopped raining, the overcast skies continue to give sleepless nights to farmers. It is learnt fast blowing winds have flattened crops at various places. "A rise in the temperature is good to prevent the attack of yellow rust, which flourishes in low temperature," said Dr Gosal. Punjab has sown wheat over 33.5 lakh hectares. The procurement will begin in the first week of April. Its harvesting will be at its peak in the third week of the next month. During the meeting, Amarinder is learnt to have expressed his desire for a role in central politics. He, however, left the choice of his new assignment to Sonia Gandhi. The move, political pundits say, would not only pave the way for the previous Punjab Pradesh Congress Committee (PPCC) president’s exit from the acrimonious politics in the state, but also ensure better functioning for Bajwa. An MP from Gurdaspur, Bajwa was appointed the Punjab Pradesh Congress Committee chief on March 6. A scion of Patiala’s erstwhile royal family, Amarinder Singh had been the face of the Congress in Punjab since 1998. He had rejoined the Congress in 1998 after parting ways with the party post the Operation Bluestar in 1984. Sources said in view of the mass base that Amarinder Singh still enjoyed in Punjab politics, it would be mandatory for the party to given him an “honourable” job. They said a berth in the Union Cabinet was unlikely as his wife and Patiala MP was already a minister at the Centre. Congress insiders said Amarinder Singh could be adjusted in the party’s key central committees or even as a general secretary. Options like posting him as a Governor or as an ambassador have also not been ruled out, though these appear to be improbable. “His new role will be in consonance with his seniority,” a central Congress leader told The Tribune. Adjusting Amarinder becomes even important as there are several sitting and former MLAs in Punjab who are still loyal to him. Bajwa’s elevation to the top post has not gone down well with them. A few of them even skipped a key meeting called by the new state chief to be with Amarinder Singh at his ancestral home near Chail in Himachal Pradesh recently. They even skipped a lunch hosted by Bajwa on March 9 in Chandigarh. As Amarinder Singh has so far not given any clear signal to his loyalists, the latter have reportedly been avoiding Bajwa. Participating in a debate on the Union Budget in the Lok Sabha today, Harsimrat said the Budget "exposed its disconnect" with the people. She also lambasted the rhetoric of central schemes and funds helping the states. She said: "It is not possible (for Punjab) to pay the accumulated debt. We request you to waive the loan or at least restructure our debt and stop charging interest". Firmly putting the onus on the Centre for the militancy period loan, the MP said Punjab was a revenue-surplus state. "The nine years of President's rule (imposed in intervals during 1980-1995) rendered it revenue-deficit," she said. Harsimrat said: "Congressman often blame the state of eating into central funds. However, it is the other way round as the Centre runs its show on states' funds and growth". UPA policies had created stumbling blocks to further delay the nation's growth, she alleged. "Look at the mishandling of the coal situation. Due to the policy mismanagement, 40 per cent of our installed power generation capacity is awaiting coal allocation," she added. Introducing the proposal, Harpreet Singh said a national survey showed that at least 15-20 per cent of food at these lavish marriage parties went waste. Bholath MLA Bibi Jagir Kaur said it was ironical that people went in for lavish parties while solemnising their marriage in front of Guru Granth Sahib, which carried the teachings of Gurus who preached that a marriage should be a simple affair and no lavish ceremonies should be encouraged. Talking to The Tribune, Capt Amarinder said this incident took place in 1986 when he (Capt) was the legislature party leader and Badal was the head of the 23-member breakaway Akali group, which had parted ways with Surjit Singh Barnala. Describing the incident, Amarinder said at one moment, all the legislators had been protesting against the Speaker and in the next, “before you could say Jack Robinson, Badal ran up the steps to the Speaker's chair and pounced on him". The former CM said Minhas had been dragged from his chair and even roughed up in the melee. Pal was attacked on the premises of the Vidhan Sabha yesterday. The commission, headed by its chairman, Rajesh Bagha, with members Parkash Singh Gardhiwala, Dalip Singh Pandhi, today met to consider the representation of Jasbir Singh Mehta, president, Guru Ravidass Welfare Society, Mohali. Mehta had requested the commission to take strict action against Congress MLAs who had assaulted a Dalit Head Constable on duty and ridiculed him with casteist remarks. A notice was also issued to the Secretary, Vidhan Sabha, to provide a factual report on the incident. One copy of the complaint was forwarded to the National Commission for Scheduled Castes, New Delhi. There are some farmer organisations which are not participating in the protest while others are projecting economic issues on the top of their agenda for protest, maintaining that the arrest of farmer leaders is also an issue. The Kisan Sagharsh Committee, Punjab faction, led by Kanwalpreet Singh Pannu, is not taking part in the March 18 protest. Pannu said: "The organisations staging the dharna had held a meeting to chalk out their strategy, but we were not taken into confidence. The Bharatiya Kisan Union (Ugraha) and the Dehati Mazdoor Union are also not joining the protest". On the ASI case, he said an independent probe should be ordered to bring out the facts. Jamhuri Kisan Sabha leader Rattan Singh Randhawa said they would raise key issues like inflation, unemployment, and government's failure to extend remunerative prices of crop to the farmers during the protest. "We are not Maoist outfits. The government must talk to us for a resolution of our key issues". On the ASI case, he said it was also one of the issues. He said the government should order a judicial probe by a sitting judge into the case. Meanwhile, Kisan Sangharsh Committee (Satnam Singh Pannu group) general secretary Sawinder Singh Chutala denied that there was any rift between the farmer bodies. This faction will be leading the protest as those arrested in the ASI case are associated with it. He said the topmost issue during the protest would be the "oppression unleashed by the state government against the farmers". The district administration and the police are preparing to deal with the farmers’ protest. Deputy Commissioner Balwinder Singh has already imposed Section 144 of the CrPC, banning demonstrations and rallies in the district. SSP KS Dhillon has also hinted towards making preventive arrests of farmers. They were largely supported by people from all walks of life since the MC has also imposed heavy taxes on all residential properties and vacant plots. Hundreds of people gathered at the Sheranwala Gate today and after marching through the city, staged a dharna outside the office of the Patiala Municipal Corporation. They demanded that from April 1, property tax be implemented in accordance with the tax levied by the neighbouring state governments. The crowd raised slogans against the Punjab government and the Patiala Municipal Corporation. Committee president Rakesh Gupta said the property tax had been fixed keeping in view the zonal rates which were higher than the collector rates. “The government is pursuing a very high tax policy. Firstly, the government has replaced house tax with property tax which is very high. Secondly, it has proposed to fine defaulters 25 per cent of the tax. “Thirdly, those renting a property will have to pay double the rate of tax on the owner’s property. These measures will ruin the small traders who are operating from rented shops,” said Harvinder Singh Awal, press secretary of Patiala Vyapar Mandal. Property tax also rocked the general house meeting of the Patiala Municipal Corporation that was called to pass the Rs 139-crore budget for 2013-14. Municipal councillors from various parties protested against the implementation of property tax in the city. Following the ruckus in the house over the issue of property tax, acting Mayor Jagdish Rai Choudhary, who presented the budget, assured the councillors and said the property tax would be reviewed and not be implemented in its original form. The MC today passed a budget of Rs 139 crore for year 2013-14 as compared to last year’s budget of Rs 126 crore. However, money to be spent on development works has been reduced. While the Patiala MC had allocated Rs 73.81 crore for development works in 2012-13, they reduced it to Rs 67.80 crore this year. Similar to last year, the MC plans to collect Rs 40 crore from the sale of corporation land to match the deficit between the income and the expenditure of the corporation. The MC further plans to generate revenue of Rs 30 crore after imposing property tax on all residential and commercial establishments. Last year the MC had collected Rs 13.50 crore under house tax. Parminder Singh, PU Controller for Examination (COE), said even though the students exhausted their mercy chance, the college still admitted them into the next year. “The decision not to allow the students to appear for the exams or penalise the college or take both the measures rests with the syndicate,” the COE said. A senate member said the university should set a precedent and heavily penalise the college for breaking the rules. The directions by the Division Bench of Justice Surya Kant and Justice RP Nagrath to the State, Greater Mohali Area Development Authority (GMADA) and other respondents came on at least two petitions filed by Gurmeet Singh and other petitioners. Describing himself as a riot victim, Gurmeet Singh in his petition had sought directions to Mohali Deputy Commissioner and GMADA to deliver the “peaceful possession” of a LIG flat in Phase XI. He added the flat was allotted to him vide letter dated August 16, 2012. A red card, signifying that he was a victim, too, was issued in his favour by the authority concerned. But, the flat’s possession was not delivered to him, though more than a year has passed since the issuance of the latter. The petitioner averred earlier he was in illegal possession of a flat, but was dispossessed on August 25, 2012. The Bench asserted that somewhat similar relief was sought in another petition filed by Jasbir Singh against the State of Punjab and others respondents. It was disposed of in October last year with a direction to the respondents to consider the petitioner’s claim for handing over the possession of the dwelling unit allotted to him. “Since in the instant case also, an LIG flat has been allotted to the petitioner and the respondent-authorities have not delivered its possession till date, we deem it appropriate to dispose of this writ petition with a direction to the respondents to consider the petitioner's claim and redress his grievance as early as possible but not later than two months from the date of receiving the order’s certified copy,” the Bench concluded. The accused has been identified as CP Yadav. He was a colleague of Sunil Katyal, a pharmacist who used to conduct authenticity tests of drugs for international smugglers Anoop and Mandeep Singh Gill. Sunil was arrested on March 7. It is learnt that during the questioning, Sunil told the police that Yadav had been conducting the drug tests along with him. Sources said the police today raided the premises of a pharmaceutical company on the Hambra road and Yadav for questioning. The police also conducted a raid at Payal to arrest Babbu, an accomplice of Jagdhish Singh Bholla.